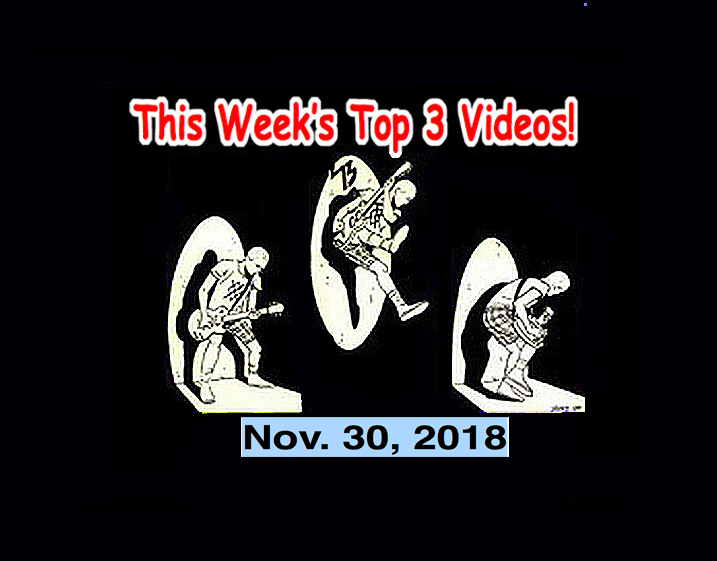 It’s time once again for this week’s Top 3 videos for the week of Nov. 30, 2018! First up is a Bubblegum Punk/ Power Pop/ Rock n’ Roll outfit from Montreal called Pale Lips! Pale Lips are a “Drippy mascara slopped rock n roll with sprinkles” rock n roll outfit! 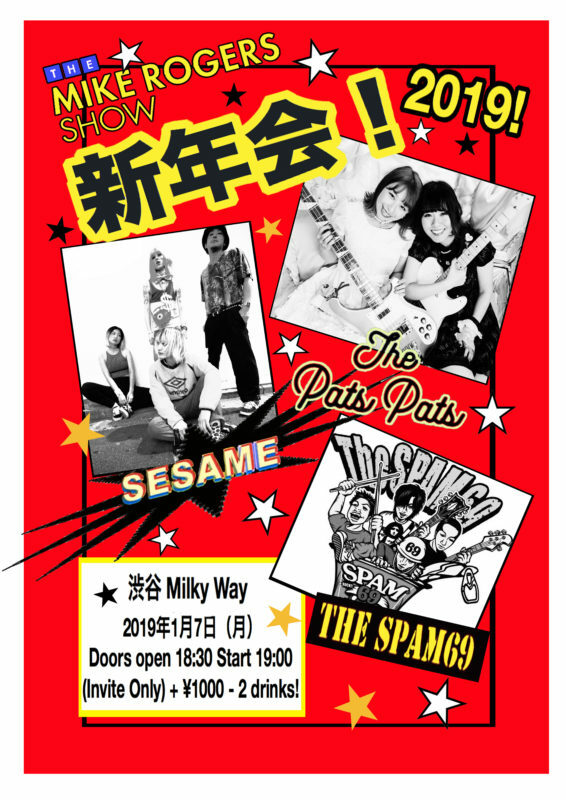 They are inspired by the Ramones, so that all sounds good! This is their newest video hot off the presses! At #2 is another song by Silke Berlin! Silke just sent me a treasure box full of goodies to giveaway to listeners on my FM radio show! The Mike Rogers Show” (Every Sunday morning from 5 am ~ 7 am on InterFM 897 in Tokyo, Radio Neo 79.5 in Nagoya, and nationwide simulcast on Radiko.jp!) Check it out for tons of cool new music every week! This video is 3 years old but it still cracks me up. SPOTLIGHT ARTIST! This week’s Spotlight Artist is an artist that will appear at my New Year’s Party on Jan. 7, 2018 (Monday) along with The Pats Pats and the Sesame! Get your tickets now! (They are free (+¥1000 for 2 drinks!) At Shibuya Milky Way! Be there! Today we will feature Spam69. These guys are nuts! ‘Matsuchiyo – Life of a Geisha‘ World Premiered at the 2018 Raindance Film Festival in London, England. 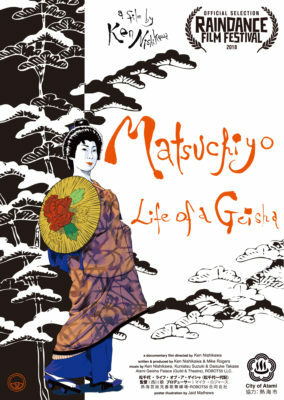 ‘Matsuchiyo – Life of a Geisha‘ is a documentary about one of the last true geisha in Japan. From her wartime childhood to geisha apprenticeship to the glory days of a top geisha. This film illustrates the trials of the ultimate Japanese cultural enigma that is – The Life of a Geisha. “Ghostroads – A Japanese Rock and Roll Ghost Story,” enjoyed its World-Premiere at the Raindance Film Festival in London on Sept. 25, 2017, and was released by a major Japanese motion picture company and in theaters all across Japan. The DVD and Blu-Ray went on sale all across Japan on June 13, 2018! It also enjoyed its Canadian theatrical release on August 31, 2018! Ghostroads – A Japanese Rock n Roll Ghost Story DVD and Blu-Ray on sale all across Japan and available on rental everywhere in Japan! About Mike in Tokyo Rogers: Mike has been a professional music/TV/radio/anime-related program producer in Japan since the eighties. He began in the music business in 1977 as lead vocalist with the legendary Los Angeles Punk Band, “The Rotters” (Sit on My Face Stevie Nix.). As a university student, he was assistant to the legendary Rodney Bingenheimer (Rodney on the ROQ – KROQ Los Angeles from 1980 ~ 1981.) Mike was the first and only foreigner in Japanese history to become the General Manager of a major Japanese broadcasting station (TV Tokyo owned InterFM). Has produced a few smash hit programs (some real losers, too!) and several of Tokyo’s highest rated and most famous radio programs. A recent hit Internet TV program was “The TV Show” (Set Program with “Ninja Slayer”) which, between April – Oct. 2015, garnered over 10 million viewers. He is currently producing and hosting “The Mike Rogers Show” every Sunday live on InterFM 89.7 in Tokyo and Radio Neo in Nagoya 79.5 and nationally broadcast on Radiko.jp (Internet radio). And he is the creator and founder of the Mt. Fuji – Atami Film & VR Festival. Also his life’s dream is his just completed full-length motion picture, “Ghostroads – A Japanese Rock and Roll Ghost Story,” which enjoyed its World-Premiere at the Raindance Film Festival in London on Sept. 25, 2017, and was released by a major Japanese motion picture company and in theaters all across Japan from Sept. 2017 ~ Mar. 2018. The DVD and Blu-Ray went on sale all across Japan on June 13, 2018! His next project, “Matsuchiyo – Life of a Geisha” world premiered at the 2018 Raindance Film Festival in Oct. 2018. Mike is also an Official Jury member to the 2018 Raindance Film Festival in London making him the first person ever to serve as a Jury Member from Japan in Raindance Film Festival history.